Tomorrow I’ll participate in the inaugural World Book Night in the United States as a volunteer book giver. More on that later, but first I thought I’d give a quick review of the book I’ve decided to give: Jhumpa Lahiri’s 2003 novel The Namesake. Synopsis: In the 1960s, Calcutta natives Ashoke and Ashima Ganguli wed via an arranged marriage, shortly departing for the United States, where Ashoke is a PhD student at MIT. Shortly thereafter, Ashima gives birth to their first born child – a son – and as per Indian custom they struggle to choose a name, ultimately relying on a postal letter from Ashima’s grandmother in India to deliver this honor. When the letter fails to arrive, and the new parents are forced to choose a name for the birth certificate before their son is released from the hospital, they decide on the name “Gogol” — after the Russian author, and in memory of a tragic event from Ashoke’s past. The novel spans over thirty years of the life of the Ganguli family in their new home in the United States. The generational gap between parents and offspring, the cultural barriers the Bengali family faces, and Gogol’s struggle with his own identity and the awkwardness that surrounds his name all form central themes around the story. About the Author: Born in London to Bengali parents, Jhumpa Lahiri currently resides in Brooklyn with her husband and two children. Her debut work of fiction, a collection of short stories entitled Interpreter of Maladies, won the 2000 Pulitzer Prize for Fiction. She is currently a member of the U.S. President’s Committee on the Arts and Humanities. Her novel The Namesake was also made into a 2007 film starring Kal Penn. My Thoughts on the Book: The Namesake is perhaps the best book I’ve read in a long time, at least since I read Anthropology of an American Girl about a year ago. The novel is a third person narrative, yet Lahiri effortlessly jumps between the points of view of her main characters so that you really feel Ashima’s loneliness yet sense of duty, and Gogol’s rebelliousness yet sense of loyalty. Those who regularly follow my blog and read my book reviews will know that I am a huge fan of books that bring insights into cultures other than my own, and for its focus on Bengali/Indian culture and the immigrant experience, I really appreciated this book. At times I envied Bengali traditions, while at other times appreciated my own culture. While the plot of the book largely centers around Ashima coming to terms with her loneliness and Gogol coming to terms with his identity, I never found myself bored. With captivating prose and the depth written into each character, this is one of those novels that I couldn’t put done. Post in Comments: Have you read The Namesake, and if so, what did you think of it? Also, if you received a copy of The Namesake from a World Book Night giver on April 23, I hope you will post your thoughts on the book here once you’ve finished reading. 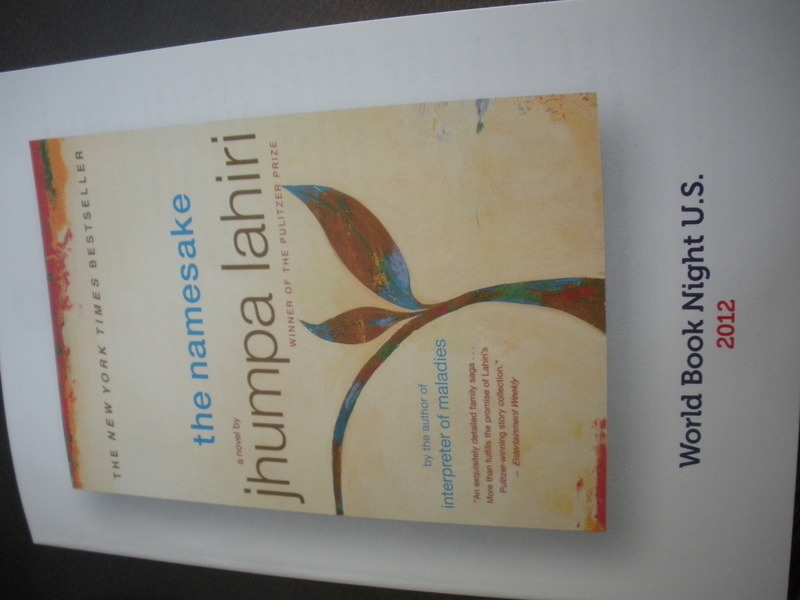 This entry was posted in Around the World Virtual Book Club, Movie Reviews/Book Reviews and tagged Bengali culture, book reviews, fiction, Indian culture, Jhumpa Lahiri, World Book Night. Bookmark the permalink.